Some think I’m from Northern Ireland. Some try and guess whether I’m from Canada or the US. The answer always leaves people surprised. If you have been following Miel and Mint for a while, you most likely know that I live in the UK but I am not British (yet). I am originally from Ukraine but I also lived and studied in the United States. Then I married an Irish ( / Norwegian because my hubby grew up in Norway) and now we are based in England. Yup, that might be a lot to take in. I do love the fact that I’d lived in so many different places in the world. It has taught me a lot and shaped my character in many ways. Moving countries sounds like a fun experience (and it is – take it from someone who did it a few times) but it has its ups and downs. 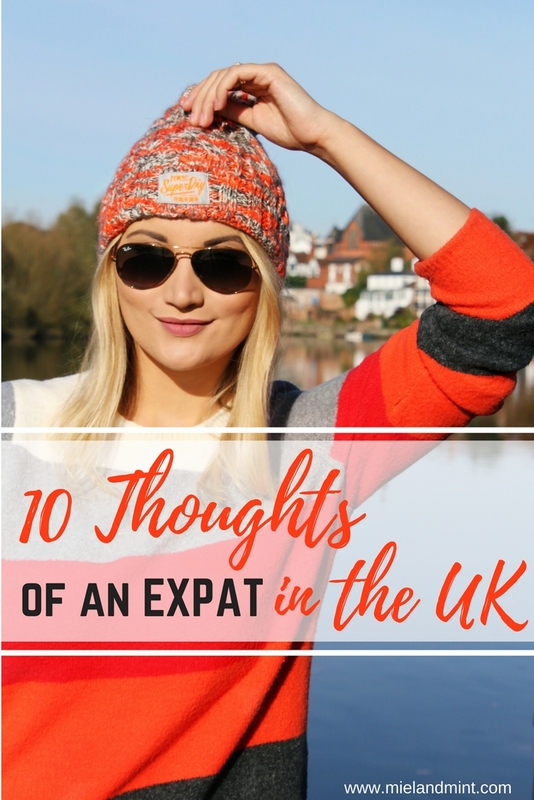 Being an expat is not always “a walk in the park”, no matter where you’re from and where you’re moving/moved. At the same time, it has so many advantages, and they 100% outweigh the drawbacks. They do in my case. The 30th of November 2017 marked 3 years since I moved to the United Kingdom. And boy, what 3 years I had! To be honest, the UK is nothing like I imagined it to be (it’s SO MUCH BETTER!). Probably about 5% of the stereotype I had in mind was accurate. In 3 years I’ve learnt so much, I’ve grown a lot and I’ve fallen in love with this country. As much as I’m used to living in England, I’m reminded about the differences between the UK and Ukraine (or the US) on a daily basis. I like my tea black. Or I used to? Being an expat in the UK, you might find yourself changing your preferences about what you eat and drink. Maybe not right away. Eventually. Of course, you can ask for ‘no milk’ when someone is making you a cuppa. I also now know the reason behind the “white tea”. English tea is ridiculously strong so milk is added for a smoother taste. That’s why many locals, who don’t drink milk or like their tea black, would ask you to dip the tea bag into the cup with hot water for a mili-second! 2. Good manners do exist. I’m sure they do in other countries too but the UK is that “good kid on the block” when it comes to politeness. Someone will always hold the door for you. Queue is always respected and never jumped. Also, people barely touch you when they pass by, but they still say “sorry”. I’m used to it now and I do the same thing. But whenever I’m out of the country and then come back to England, I’m amazed every single time how polite (most!) people are. 3. The accents! The sheer volume of accents! When I was younger, I thought there were only two accents in the UK: RP (Received Pronunciation), which is that “typical” English accent, informally known as ‘Queen’s English’ or ‘London English’, and Scottish. Boy, looking back I remember both were so difficult to understand sometimes. I was only used to American English. Now, imagine my surprise when I moved to Northern Ireland. A whole new language with its “wee” everything (“Take a wee seat and I will make you a wee cuppa tea so we can have a wee chat”). I remember the first time when I went to visit my hubby (then boyfriend) and met his friends for the first time. Usually lively and chatty, I was barely taking and smiling a lot because I couldn’t understand 90% of the conversations. I love ‘Norn Iron’ and I’m happy I picked up a bit of an “Irish twang” to mix it in with my American English. Strangely, for a Northern Irish ear, I sound very American. When we moved to Chester and I started speaking to local people as well as friends in Liverpool and Manchester, there was a much bigger challenge for my ears. Did you know that there are interpreters from Scouse into English? I know, I was surprised too. I think it’s amazing there are so many different accents in the UK. They represent much more than just an area. Each part of the country is a little world of its own. 4. If you’re invited for “tea”, you might be in for a surprise. I’ve lived here for 3 years and I sometimes (still) struggle to understand what people mean. Basically, when someone tells you they are making “tea”, 99% of the time they are making dinner. The best way to tell the difference is either a) listen if they say “a cup of” (for example, “Would you like to come to ours for a cup of tea?”) and b) just ask if you’re not sure. Then there’s also “afternoon tea” but that’s a whole new story. It’s ahhhmazing, by the way! 5. Hot drink first. Dessert after. While we’re on the topic of food in the UK, this one bugs the life out of me. OK, it doesn’t really but I still can’t get used to it. When you’re visiting in a British home for lunch or dinner (aka “tea”), you will most likely be treated to a dessert or given a choice of desserts your hosts might have at home. Then, when you’re finished, you will be offered a cup of tea or coffee. Personally, I like my hot drink WITH my dessert. But I always adjust to each home individually when we visit friends and family. NB: Even if you like things your own way, make sure to be polite and thankful for the hospitality and “do as Romans do”. This is a question that puzzled me for a good couple of months when I first moved to the UK. To someone who’s been speaking American English for years and years, I thought, “What made them think I wasn’t okay?” Haha. Until it finally dawned on me. No one expects you to give a breakdown of how you’re actually feeling today. A quick “Yup, how are you?” as a reply will suffice. 7. What do you REALLY mean? That’s another puzzle for someone who wasn’t born and raised in the UK. “We must catch up soon” often means “We will probably not see each other for a few years”. “This is nice” sometimes translates “I don’t like it at all”. “That’s interesting!” might actually be “This is so boring” or “I couldn’t care less about it”. Jokes aside, British culture and the way people communicate here may be confusing but it’s also very interesting. I mean it, it IS interesting. Those of you who aren’t British, don’t worry, not everyone in this country says stuff with a hidden context or a double meaning. Once you get to know the person, you’ll understand exactly what they’re trying to tell you. 8. It doesn’t always rain here. Everyone knows that typical English stereotype about a forever cloudy sky and rainy weather all day, every day. Yes, it is a lot gloomier in GB than, say, in California, but it all depends where you live or travel to in the UK. I don’t think I’ve ever seen more rain anywhere than in Northern Ireland (and Ireland). No wonder NI and ROI are collectively called an “Emerald Isle”. All the greenery is a result of the almost never-ending rain. Since we moved to Chester, we’ve been loving sunny summers and surprisingly little amount of rain. Well, London is even drier and sunnier! So forget about “Туманний Альбіон” or the “Cloudy Albion” as Great Britain is often labelled in Eastern Europe. 9. The shops are amazing! Fashion in the UK is on a whole another level. 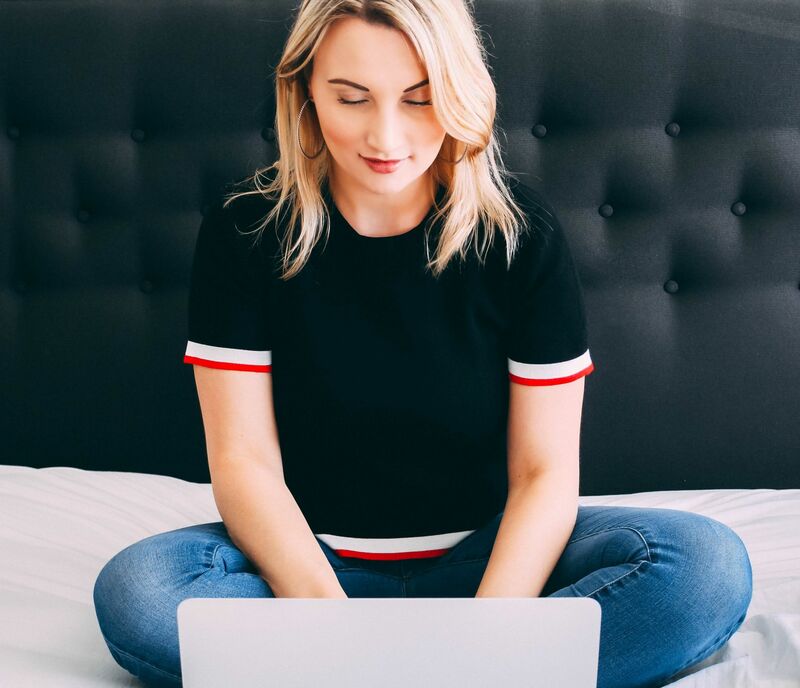 There is an amazing selection of stores that are well loved across the country: Selfridges, Topshop, New Look, River Island, Warehouse, Superdry, Primark, ASOS, Boohoo, Missguided, Miss Selfridge – just to name a few. If I could describe the fashion scene in Britain in one word, it would be FEARLESS. Girls in the UK like to mix and match styles, patterns, textures and whatnot. However, there is one thing that I can’t/won’t adopt – summer clothes and shoes in winter! Personally, I’m a fan of either the casual / smart casual look or the elegant/glam/stylish-while-still-being-modest clothes. Here in the UK the perfect example of that combo is lovely Victoria McGrath (In The Frow). One thing I remember from the time when I studied in the USA was that everyone was super friendly. Everyone smiles at you and it makes you feel like you belong. Especially if you’ve just arrived into the country and don’t know anyone. In the UK people might seem distant when you meet for the first time. Careful. With a “don’t-get-too-close-to-me” kind of look about them. You might not even get a smile. Once you get to know each other, show that you genuinely care about them, and also find out that you actually have a good bit in common, the situation changes completely. You might have just made a friend for life. Hat – Superdry (out of stock) – other hats I love here, here and here. There are SO MANY MORE things I could add to this list but then this post is long enough already. I hope you enjoyed these 10 little observations of mine. Leave me a comment and let me know which item you agree with the most. Did anything surprise you or make you laugh?